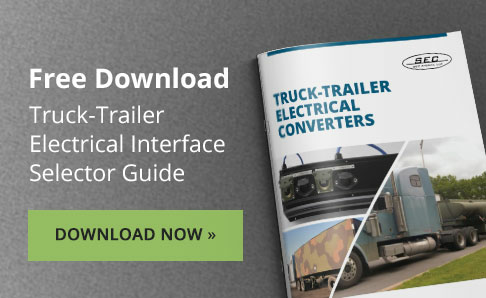 UTC 2412-RVEB is an electrical interface between a NATO 24 Volt towing vehicle and a 12 Volt North American civilian RV trailer, specifically for use with electric trailer brakes. UTC 2412-RVEB provides 6 independent circuits capable of supplying a total power of 800 Watts at 12 Volts through a 7 position blade connector. The same connector pins conventionally designated for their respective functions on both the truck and trailer are used. The interface’s compatible connectivity translates into effortless installation. The brake signal is fed directly from the truck’s NATO connector to the corresponding 7-way output connector feeding the trailer. UTC 2412-RVEB is compact and lightweight at only 15 pounds. It has a flat profile making mounting practical to either towing vehicle or trailer.